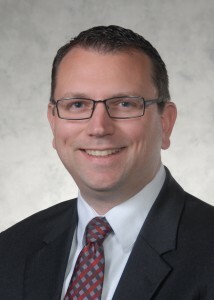 The Greater Poulsbo Chamber of Commerce announced Dan Barry as its new director of operations. Barry will oversee board governance, marketing, membership, event planning and staff management, according to a news release. 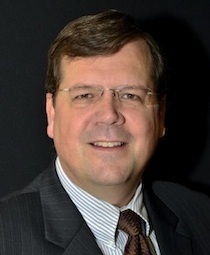 He replaces Marc Abshire, who departed for the Port Angeles Chamber of Commerce in January. Barry worked as a sales manager at another chamber, and held management positions in the banking, mortgage, and travel industries. 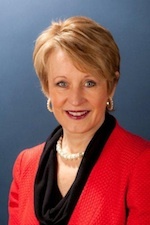 “The Greater Poulsbo Chamber has become the catalyst for business prosperity, connections, and opportunities in our business community,” board president Ingemar Anderson said in the release. Barry was named Volunteer of the Year in 2015 by the Poulsbo Rotary Club and was a 20 Under 40 award recipient of the Kitsap Peninsula Business Journal. He lives in Keyport with his wife and 4-year-old daughter. The Greater Poulsbo Chamber of Commerce is under interim leadership following the resignation of former director Marc Abshire. Abshire stepped down to take a job as executive director of the Port Angeles Regional Chamber, according to a story in the Peninsula Daily News. He was hired in Poulsbo in October 2014. 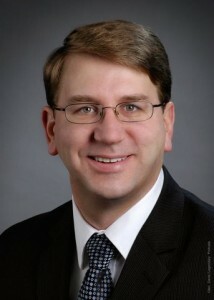 Poulsbo Chamber board treasurer Dan Barry will serve as interim director, according to a news release. “Poulsbo is experiencing historic growth and dynamic new economic opportunities and the board is excited to work together to renew, strengthen and build partnerships in 2016,” Poulsbo Chamber President Ingmar Anderson said in the release. The chamber’s annual gala and awards ceremony is scheduled for Jan. 16 at the Clearwater Casino event center. Per capita income grew faster in Kitsap last year than in most Washington counties. Kitsap posted the 10th largest increase in per capita personal income from 2013 to 2014 among the state’s 39 counties, according to a recent report from the Bureau of Economic Analysis. Per capita income grew 5.3 percent in Kitsap during that period, besting the state average of 4.5 percent. The county’s per capita income level reached $46,573 in 2014. Kitsap ranked fourth for per capita income, behind King County ($68,877), San Juan County ($59,831) and Island County ($46,608). Personal income is the total amount earned by residents from wages and other income sources, before taxes. Per capita income is calculated by dividing personal income by population. 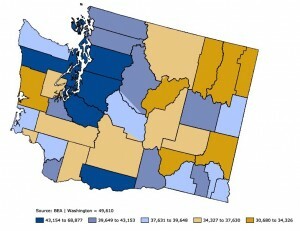 The growth in per capita income for 2014 came on the heels of a statewide slowdown in 2013. 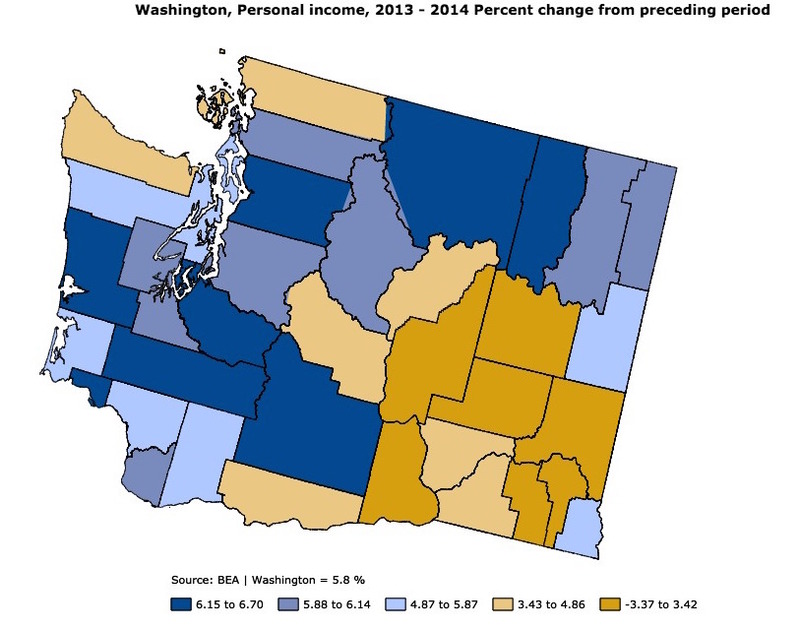 Per capita income in 0.6 percent in Kitsap between 2012 and 2013, and 0.3 percent in Washington.